U.S. homeowners pay approximately $9,080 per year in hidden costs related to owning and maintaining a home. Having a serious conversation with buyers about their budget can help them avoid falling in love with a house they cannot afford. A home’s affordability goes way beyond the monthly mortgage — it includes insurance, maintenance, utilities, taxes and other unforeseen to-dos along the way. So, how do these extra costs impact a buyer’s ability to actually afford the home they’ve been eyeing? According to a joint study by Zillow and Thumbtack, the average U.S. homeowner will spend $9,080 on these expenses per year, which breaks down to an extra $757 per month on top of the mortgage. Unavoidable: refers to things such as property taxes and utility bills. When it comes to those avoidable costs, the average homeowner spends $3,021 per year, with the majority of those funds going to house cleaning and lawn maintenance. 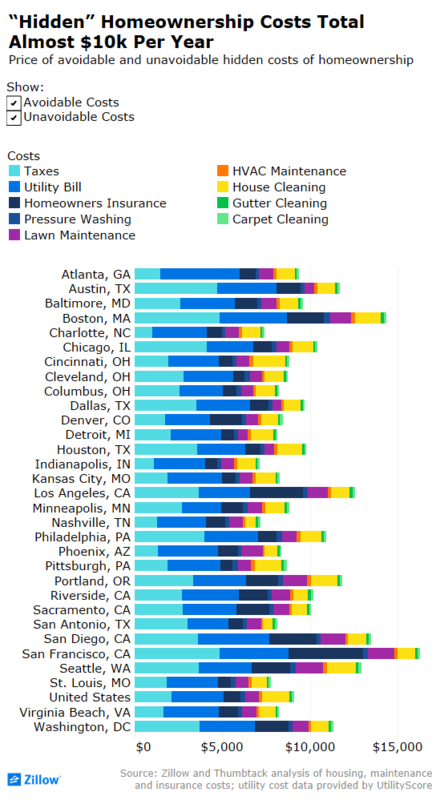 Out of the 25 markets included in the study, Seattleites ($4,052), Portlanders ($3,674) and Bostonians ($3,570) spent the most on these expenses, while Nashvillians ($1,997), San Antionians ($1,962) and Dallasites ($2,082) spend the least. These numbers are not particularly surprising since living on the coasts is notoriously more expensive than living in the Midwest or South. When it comes to unavoidable costs, the average homeowner spends $6,059 per year, with $2,953 going toward utility bills, $2,110 going toward property taxes and $996 going toward homeowners insurance. Homeowners in San Francisco are shelling out the most. On average they’re spending $4,831 in taxes, $3,928 for utilities and $4,260 for homeowners insurance, with owners in Boston ($10,807) and San Diego ($10,392) trailing not too far behind. Meanwhile, homeowners in Indianapolis are spending the least, only shelling out $1,094 in taxes, $2,917 for utilities and $689 for insurance. Charlotte ($4,986) and Nashville ($5,172) shored up the end of the pack for the most affordable cities. The differences in taxes, utilities and insurance vary state-to-state and are greatly influenced by things such as whether an area is prone to floods, earthquakes or other natural disasters, the area the home is located in and any extra measures an individual homebuyer chooses to make in protecting their home. Another detailed study by Attom Data Solutions and UtilityScore brings home the impact that extra $9,080 in homeownership costs can have on buyers who are weathering consecutive home price peaks. Attom and UtilityScore’s study covered 931 U.S. counties with a combined population count of 255 million. According to their statistics, the average buyer looking for a median-priced home would need to spend 34 percent of their income on monthly housing costs, which is slightly above the affordability threshold of 30 percent. To help buyers make better short-term and long-term housing decisions, both studies suggest agents have serious conversations with buyers about what they can afford when these expenses are factored in. Agent should steer their clients toward homes they can comfortably pay for even if those homes have a smaller yard, less square footage or are missing some of those “wow” amenities. Lastly, agents can provide advice on cost-saving measures, such as installing solar panels, utilitizing smart home technologies and installing energy efficient appliances. Where can first-time homebuyers catch a break? What percent of income are buyers spending on mortgages?